I had the great opportunity of meeting Julie in Charlotte, during the Authors After Dark Convention back in August. That was my first time ever hearing her name, and ever since then I have followed her, like a stalker! LOL! No, seriously... I started my blog, and began my quest to learn and read as much as I could on Julie. I read her book, Fallen, then had the pleasure of reading her new book Southern Roots. I had a good feeling about Julie when we met, and want to do my best to help her succeed. Julie has so generously agreed to give some awesome stuff away! YAY GIVEAWAY!! I am the lucky person that gets to host said GIVEAWAY. There will be a first place winner, and a second place winner. A signed copy of Julie's new book Southern Roots! 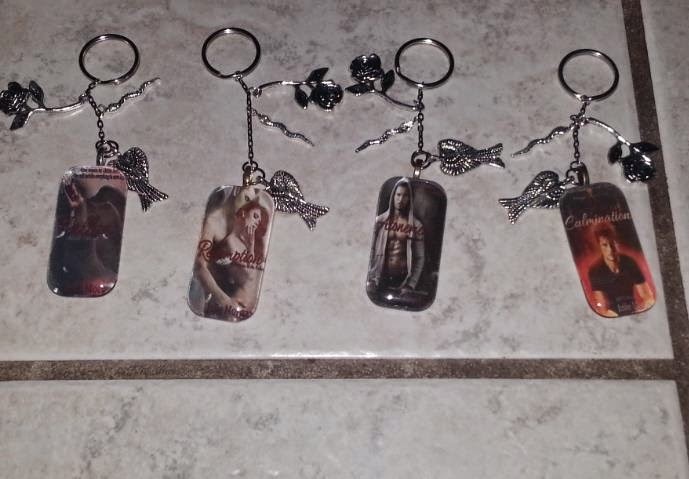 A signed postcard, and four key chains, each representing the book covers from her Fallen series. Kim: What was your inspiration for Southern Roots? Julie: I watched teens one afternoon jump from a cliff into a lake here in Florida. It reminded me of when we used to cliff jump back in Texas. The story formulated itself after that. Kim: During the creative process of character development, was there anyone based on your real life? Julie: LOL! Yes, actually. Keeping names aside, Bobby Ray and Blaine were based off of people I knew in my past. Kim: You go girl! LOL!! Kim: Will you return to the paranormal world of writing after this series? Julie: Absolutely! Paranormal is my go to genre. It always has been, even as a child. Did you intentionally name the character Xander Harris in your book Fallen after the character in Buffy the Vampire Slayer? Julie: LOL no I did not name Xander Harris after the Buffy character. That was purely coincidence. Kim: What was your favorite book as a child? Julie: This is hard to answer. I had SO MANY! Julie: Now my favorite book, well there’s more than one. The Hunger Games trilogy, Bram Stoker’s Dracula, Divergent (hello, love Four!) and a few others. Kim: How do you balance your writing time with your family time? Julie: It is difficult at times. The human behind the books also works full time. I usually write in the evenings a few days a week. I set up at my local coffee shop, plug in the headphones and get into the story. Kim: For everyone out there who doesn't know, you have a daughter with autism. You must have a GREAT support system within your family to be able to do what you do. Does your community have good resources for families with children and/or adults with autism? Julie: Yes, we have an excellent community. Her school system is amazing with her! I could not ask for better people to teach my child in school. She was diagnosed with 17th Chromosome Duplication. What this means is she has epilepsy and autism. She’s highly functional and LOVES talking to people and loves books. I foresee good things with this little girl! Kim: It is so great that you show your support on autism publicly. You have an outlet to share and spread the word through your books. Would you like to say something now, to the people who may or may not be familiar with you or autism? Julie: Take time to look deeper. Autistic people (adults and children) think differently, but this does not mean they are different. They are people, just like the rest of us. Don’t treat them differently, don’t make them feel ‘special’, and please, don’t tell me “I’m sorry” for my child being autistic. There’s nothing to be sorry about. I love her for who she is. She has brought so much love into my heart. I have the rare ability to see the world through her eyes. Not everyone has that opportunity. If you would like more information and/or would like to donate to research, there are many outlets to look into, like Autism Awareness. Julie: Thank you SO MUCH!!! It was a pleasure meeting you and I hope to see you again soon! #19. I commented and it didn't post :/ But I'm here now! Keychains, woohoo! 23! What a great interview!